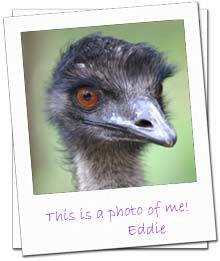 Hi I’m Eddie Ratite the Emu. I'm the second largest bird in the world after my cousin the Ostrich. I'm nearly 6 1/2 feet tall (2 meters). No one in our family, the Ratites, can fly - but we can all run really fast. I take long strides and can run at speeds up to 30 miles per hour (50 km/h). When I run I flap my wings to keep myself steady and stop myself from falling over. My feet are very long and I have three toes on each foot. One of the toes has a very long nail, which I use when I'm fighting. I don’t fight very much. I’m really very shy and easy going. I'm very curious too. I stick my nose into everything and if I don’t understand something I stomp on it. My father says that’s going to get me into trouble one day. My father has looked after me even before I was born. He built a nest out of grass and sticks and other stuff he found, for my mother to lay my egg and the eggs of my brothers and sisters. The eggs were big and dark green. Then my father sat on the eggs for nearly eight weeks to protect them and make them hatch. He didn’t leave us to during the whole time. Not even to get water or food or go to the toilet. He lost heaps of weight. I love my father. 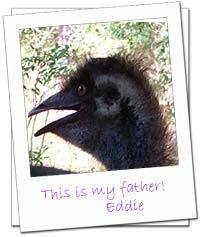 When I was born my feathers were cream with brown stripes, which helped me hide in the grass from goannas and other predators. The stripes faded after a few months and now I have light brown-grey feathers with dark tips. We emus have been here for a long time. Our ancestors the Dromornthids lived here when the dinosaurs were still around. To survive we are always on the move searching for food. I eat seeds, flowers, berries, caterpillars and insects. Anything I can find really. I once ate a tin can. I know this sounds yucky, but if I see some seeds in my poo that haven't been digested, I peck them out and eat them again. Hey, you never know where your next meal is coming from around here. I don’t worry that I can’t fly like other birds because I'm a fast runner and a strong swimmer too. When I find a dam or stream I love to lie on my back in the water and kick my legs in the air. I’m hungry now, so I am going to look for more food.